High Desert 420 is fully compliant with California State Laws SB420 and Prop 215, and we only deliver to qualified medical marijuana patients with a current, valid CA Doctors Recommendation. We carry a full selection of medical cannabis including flowers, concentrates, edibles, topicals, tinctures, hash, and CO2-extracted oils. The Best place in the High Desert to get or renew your Recommendation today! High Desert 420 is a non-profit collective offering safe and convenient access to Medical Cannabis for Proposition 215 patients with a current California Doctors Recommendation. We are a delivery service only. HD420 offers friendly and professional customer service along with fast and reliable delivery. We believe in treating each member on a individual basis, thus catering to YOU! 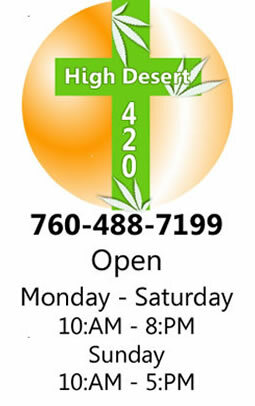 High Desert 420 is here to help you improve your overall well being with Cannabis. Our friendly and knowledgeable staff are here to answer any questions you have about Medical Cannabis. We are only a phone call away and an hour to your front door. Minimum Order required for a delivery, does NOT include delivery fee. This is a non-taxable surcharge that goes straight to the driver to help cover the cost of delivering to you. Our drivers are well informed, law-abiding cannabis experts delivering medications to our members usually within an hour or less.